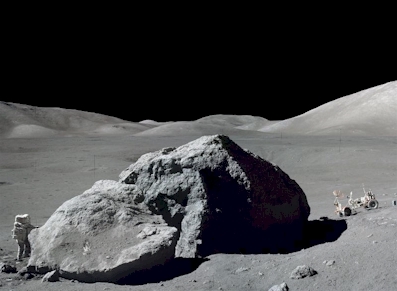 Apollo 17 astronaut Harrison H. Schmitt next to a huge, split lunar boulder. At critical times, America’s national leadership, including Congress under its treaty and funding powers, has actively recognized the strategic importance to the "common Defence" of major geographic expansion, exploration or technological development. The 1803 purchase of the Louisiana Territory from France, initiated by President Thomas Jefferson, constituted the first of these fortunate undertakings by a new nation. Jefferson, a scientist himself, dispatched the Corps of Discovery Expedition under the command of Meriwether Lewis and William Clark to explore these new holdings. In addition to thwarting the ambitions of other global powers, this exploration began the assimilation of Western resources and opportunities into the future of the country. Then, in the midst of the challenge of preserving the Union, President Abraham Lincoln showed Americans that he also understood the strategic importance of national expansion and development. In 1862, Lincoln initiated the building of the Transcontinental Railroad and the accompanying transcontinental telegraph, adding geographic, economic and political strength to the Northern cause. As Lincoln originally intended, the Golden Spike that formally joined the Central and Union Pacific Railroads forever tied together the culture, economics, and agricultural and mineral resources of the country. Following Lincoln's assassination and before the completion of the Transcontinental Railroad, President Andrew Johnson supported Lincoln's Secretary of State, William Seward, in the purchase of Alaska from Russia in 1867. Seward's opportunistic foresight has long paid dividends both in natural resources and strategic defense. As in the case of the Transcontinental Railroad, the necessities of national defense and the expansion of trade and commerce led President Theodore Roosevelt to take actions that led to the construction of the Panama Canal. Even though the Canal did not directly involve the continental United States, Roosevelt had recognized the strategic importance of moving naval units and commercial shipping quickly between the Atlantic and Pacific Oceans. As the demands of two World Wars demonstrated, this clairvoyance paid great dividends in preserving democracy throughout the globe. It also stimulated the development of many new technological capabilities, such as large earth-moving machines and electric motors that contributed to the growth of the American economy and the well-being of people throughout the world. A year and a half before President Kennedy would set the Nation on a course to the Moon, Eisenhower directed NASA to begin the development of what became the Saturn V Moon rocket. 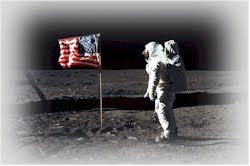 Without a jump-start on development of the Saturn V, my generation could not have met Kennedy’s goal of “landing a man on the Moon and returning him safely to Earth” before the end of the decade of the 1960s. Such a delay would have emboldened the Soviet Union to continue to press forward with its own Moon landing program. Get Your Historic "The Moon" Sign!